Thomas Crawford, Statue of Freedom (U.S. Capitol dome), 1863. Bronze (cast by Robeert Mills), 234 inches. Thomas U. Walter. 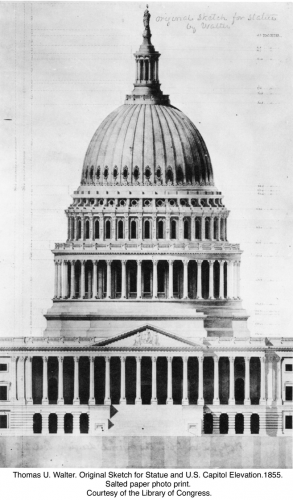 Original Sketch for Statue and U.S. Capitol Elevation. 1855. Thomas Crawford’s Statue of Freedom (figure 1), the colossal bronze statue atop the U.S. Capitol dome, dominates the Capitol and the city of Washington, D. C., by virtue of its size and placement so far above the ground. Yet this symbol of freedom is often misidentified as an Indian. Thomas Crawford’s Statue of Freedom is, in fact, a difficult monument to discern because of its location far above the viewer’s eye, but also because the artist was forced to make a number of compositional and iconographic changes to satisfy his patron, the U. S. government as represented by Secretary of War Jefferson Davis, who was in charge of the construction of the Capitol Extension between 1853 and 1857. Crawford’s Statue of Freedom, begun after the heat of the Fugitive Slave Act (1850) and the publication of Harriet Beecher Stowe’s Uncle Tom’s Cabin (1851), and completed in 1863 in the midst of the Civil War, is not only a case study in the role played by patrons in shaping and compromising the ideological content of public art, but also a monument that embodies and contributed to the intricacies of race and racism in the United States. The Statue of Freedom, in fact, participated in the battle between the North and South when Jefferson Davis used his position as the Secretary of War to eliminate any references to slavery in a public building that belonged to both regions. 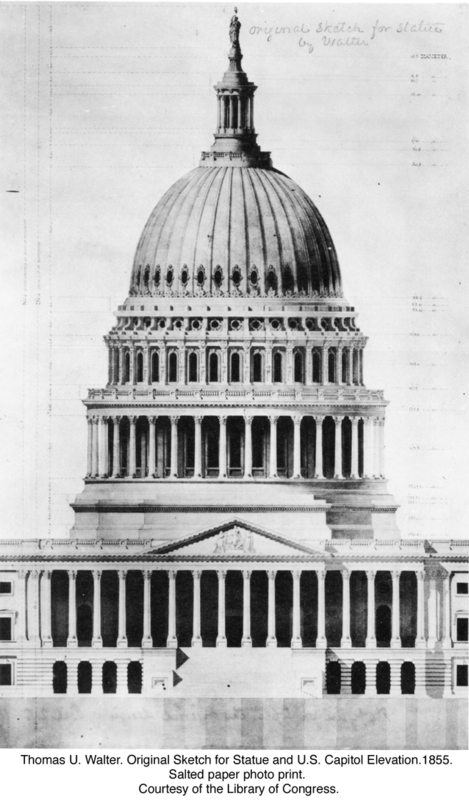 Thomas U. Walter, the architect of the U.S. Capitol, had first suggested in a preliminary drawing of 1855 (figure 2) that a monumental statue decorate the new dome of the U.S. Capitol building. In creating an allegorical female figure holding a pole surmounted by a cap, Walter appropriated the well-known iconography of “Libertas” first codified in eighteenth-century emblem books. During the French and American Revolutions, “Libertas” symbolized freedom from tyranny as is evident in the Paul Revere masthead for the Massachusetts Spy in 1781. Crawford followed Walter’s concept in his second version for Statue of Freedom in which the female figure in long robes with sword and wreath stands on a globe, wearing the “Phrygian” cap (figure 3). Secretary of War Davis considered the liberty cap that Crawford included in his proposal for the dome statue as problematic, however, arguing that the cap’s “history renders it inappropriate to a people who were born free and would not be enslaved.” He recommended that “armed Liberty” instead “wear a helmet,” given “that her conflict [is] over, her cause triumphant.” A plantation slave owner from Mississippi who argued vehemently in behalf of the slave system and the extension of slavery into newly acquired lands as a congressman, senator, and secretary of war, Davis (who would become the President of the Confederacy during the Civil War) understood the original meaning of slavery in ancient Rome and he employed semantics to argue that this ancient model was different from the southern economic system. The supervising engineer of the Capitol Extension, Montgomery C. Meigs, explained the situation to Crawford in relation to the design for another sculpture for the Capitol Building: “Mr. Davis says that he does not like the cap of Liberty introduced into the composition [because] American Liberty is original & not the liberty of the free slave.” According to Davis, Meigs explained, the cap that became a revolutionary symbol in France derived from “the Roman custom of liberating slaves thence called freedmen & allowed to wear this cap.” Davis clearly understood the practice of manumission in ancient Rome, in which freed slaves covered their newly shorn heads with the pileus cap while magistrates touched them with a rod (the vindicta). He made this argument to deny that the slaves on his plantation also desired the same type of freedom. He refused to allow any work in the U.S. Capitol Building that alluded to slavery either overtly or covertly via the cap. Such maneuvers aimed to elide the tensions between the North and the South over this volatile issue during a period of regional differences. In response to Davis’s objections, Crawford replaced the objectionable cap with a helmet and eagle feathers, transforming what had clearly been an allegory of Liberty into a confusing monument that combines three traditional personifications: Liberty (signified by the title), Minerva, and America. By adding the eagle feathers to the helmet, Crawford associated America with Liberty, an iconographic tradition that began before the Revolutionary War, where the Indian princess with tobacco leaf skirt and headdress holds the cap and pole. A majestic and robust female figure, Statue of Freedom also evokes Minerva, the Roman goddess of war and of the city, protector of civilized life, and embodiment of wisdom and reason. Crawford’s figure in fact emulates Phidias’s fabled lost statue of Athena (the name used by the ancient Greeks for the later Roman Minerva) that stood in the Parthenon atop ancient Athens. Both the ancient and the modern works include the helmet, the breast medallion, and the shield along the side. Even the fluted cloak gathered from the lower right to the upper left shoulder corresponds in these two matron types, whose immobility, severity of facial expression, military accoutrements, and colossal size express sternness and control. Crawford’s Statue of Freedom thus combines a multitude of “Others” that compose the United States democracy: the black body (as embodied by the pileus and pole, which Davis attempted to omit), the “Indian” body in the form of the eagle feathers and allegory of “America” as an Indian princess, the “female” body in the form of the female allegory, and the “primitive” body, which intersects all three. The statue thus embodies the three principal figures produced by the new nation—the African American, the American Indian, and the white woman; these Others coalesced in Crawford’s statue and in Davis’s own vision of white superiority that he insisted be represented in the U.S. Capitol dome statue, resulting in a confusing monument that many Americans misunderstand simply as an Indian princess. Vivien Green Fryd, Art and Empire: The Politics of Ethnicity in the United States Capitol, 1815-1860 (New Haven: Yale University Press, 1992; paperback edition, Athens: Ohio University Press, 2000).